Tinnitus is a very difficult condition to treat since the origins of it have yet to be completely understood or explained. However, there are treatments that will help manage the symptoms. Tinnitus can often be relieved by the use of a tinnitus masker. 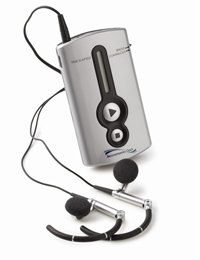 This device looks similar to a hearing aid and comes in either the Behind-The-Ear or In-The-Ear styles. The device delivers a broad band of noise that surrounds the frequency of the tinnitus. Satisfied users claim that their tinnitus is relieved during use and after the device is removed. It is thought that this occurs due to residual inhibition in the auditory system. IF YOU SUFFER FROM TINNITUS (RINGING IN YOUR EARS) YOU MAY BE A CANDIDATE FOR A NEW TREATMENT. We are pleased to inform you about a new, FDA-cleared medical device which provides long-term benefit for the treatment of tinnitus and is now offered in our clinic. If you suffer from tinnitus, you may be a candidate for this new treatment. This breakthrough treatment has been proven and validated over the last 14 years, treating thousands of tinnitus sufferers worldwide, and is now available in the U.S. In comparison to other treatments you may have tried, the Neuromonics Tinnitus Treatmentis the only customized medical device that matches your hearing and tinnitus profile and treats the cause of tinnitus versus the symptom of tinnitus (ringing in the ears). This is how and why the treatment provides a long-term benefit to tinnitus sufferers. This is a non-invasive, non-surgical treatment that is convenient to use and takes place in your own environment for about 2-4 hours per day without disrupting your lifestyle. The treatment usually takes place over a six month period. Immediate relief is achievable (typically within 0-2 weeks of starting treatment), and the tinnitus disturbance continues to improve throughout the treatment and provides long-term benefit. For more information, visit www.neuromonics.com.